The Pool Facility at the University of St Andrews Sea Mammal Research Unit (SMRU) is a unique resource available for collaborative research and as a controlled testing facility for marine equipment. SMRU has research expertise in a wide range of subject areas, from population ecology, animal physiology, behavioural ecology, acoustics, biologging and anthropogenic interactions. 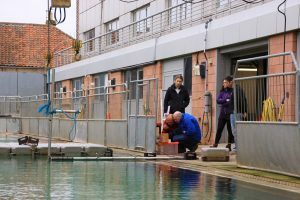 The facility is also available to test marine equipment and sensors, such as sonar, ROVs and hydrophone arrays, allowing for calibration and optimisation of equipment in a controlled marine environment prior to deployment. The modular pool design enables the division of the main pool or the creation of lane systems. Using a simulated foraging setup, seals were given the choice to forage at prey patches with differing prey densities in the presence or absence of man-made noise. Faced with a choice between a rewarding prey patch with a high level of sound, and one that has a lower level of sound but is also less rewarding, seals exhibited behaviour that balanced the degree of risk involved against the relative energetic advantage. Traditional Near-infrared Spectroscopy (NIRS) equipment waterproofed by in-house engineers was used to investigate tissue perfusion and oxygenation in seals during voluntary diving bouts. Using superficially mounted light emitting optodes this study demonstrated that seals show significant levels of deoxygenation in the brain and blubber during diving bouts, confirming their ability to conserve oxygen by uncoupling blood flow to the muscles from the core. 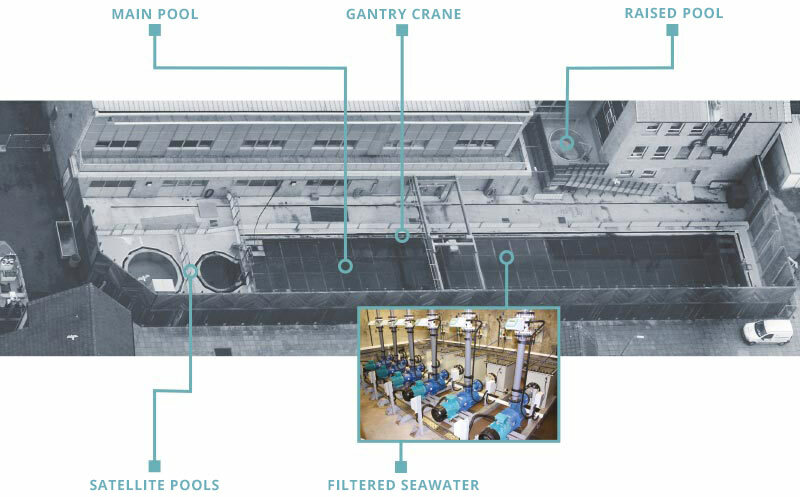 The large saltwater pools at the SMRU pool facility are well equipped to offer a testing platform for a variety of marine and underwater equipment. We offer access to and use of several pools, overhead crane, modular dock systems, 240/110V power, workshop and desk space. McKnight, JC, Bennett, KA, Bronkhorst, M, Balfour, S, Milne, R, Bivins, M, Moss, SEW, Colier, W, Bivins, D, Hall, AJ and Thompson, D, in review, Current Biology. Paterson, WD, Moss, SE, Milne, R, Currie, J, McCafferty, D & Thompson, D, in review, Cons. Physiol. What should I eat? Experimental evidence for prey selection in grey seals. Physiological aspects of moulting in phocid seals and the implications of anthropogenic disturbance. Improved estimates of digestion correction factors and passage rates for harbor seal (Phoca vitulina) prey in the northeast Atlantic. Can a Gray Seal (Halichoerus grypus) Generalize Call Classes? Potential Uses of Anthropogenic Noise as a Source of Information in Animal Sensory and Communication Systems. Grey seals use anthropogenic signals from acoustic tags to locate fish: Evidence from a simulated foraging task. Repeated elicitation of the acoustic startle reflex leads to sensitisation in subsequent avoidance behaviour and induces fear conditioning. Aversiveness of sounds in phocid seals : psycho-physiological factors, learning processes and motivation. Estimating metabolic heat loss in birds and mammals by combining infrared thermography with biophysical modelling. A Gray Seal’s (Halichoerus grypus) Responses to Experimenter-Given Pointing and Directional Cues. FORAGING STRATEGIES IN GREY SEALS (HALICHOERUS GRYPUS) : FORAGING EFFORT AND PREY SELECTION. Estimating field metabolic rates of pinnipeds: doubly labelled water gets the seal of approval. Eat now, pay later? Evidence of deferred food-processing costs in diving seals. How fast does a seal swim? Variations in swimming behaviour under differing foraging conditions. Robust digestion and passage rate estimates for hard parts of grey seal (Halichoerus grypus) prey. Feeding method affects otolith digestion in captive gray seals: Implications for diet composition estimation. 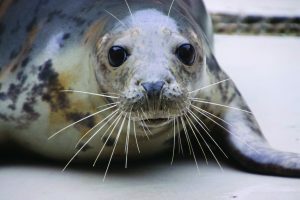 Seasonal variation in the metabolic rate and body composition of female grey seals: fat conservation prior to high-cost reproduction in a capital breeder? The metabolic rate of captive grey seals during voluntary diving.